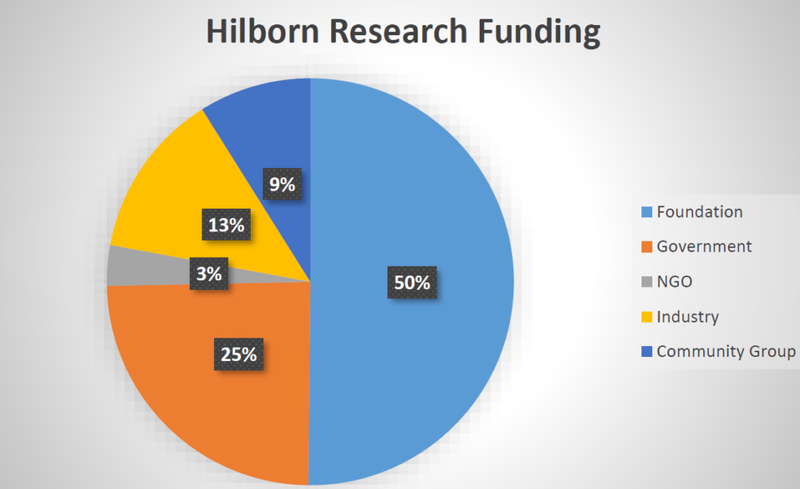 Ray Hilborn sent a note regarding his comment on a paper in the August 21st issue of Science Magazine that makes the claim that humans take up to 14 times the amount of marine fish as other predators do. The extrapolation is that humans are a super predator of marine life, and take an unsustainable proportion of the adult population of various species. Ray says the authors made a mistake in only looking at individual predators and in not considering all predation on a given species. He says that when all predation is considered, the results reverse themselves, and that natural predators take a larger proportion of adult marine fish than humans do. This paper claims that humans have a up to 14 times higher exploitation rate than natural predators. There is a basic flaw in the analysis which diminishes the validity of the conclusions the authors come to. First the calculated predation rate of natural predators will depend on how many predators you look at. Dozens or even hundreds of species may prey upon a given species, most of them taking a trivial fraction of the prey. If you find data only for the most important predators (the ones that take the most of the prey species) you will estimate a high predation rate, but if you find data for all the species that prey upon a species the median will be much much lower. In fact there are hundreds of potential predators for any species, most take none of the prey species, so if you had data for all of them you would say that the average predation rate was nearly zero for natural predators. Thus the more data on predation rate for individual species you can find, and the more you find predation data for trivial predators, the lower you will estimate “average” predation. However, if you look at the predators who take the most of the specific prey the fraction of the prey will be much higher and often more than humans. The more important question is what is the total predation rate compared to the human exploitation rate? One has to read the Darimont paper carefully to realize they are talking about rates of individual predatory species, not rates of predators as a whole. 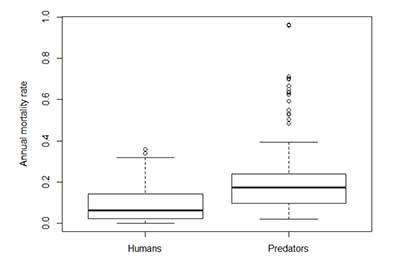 For instance their abstract says “humans kill adult prey… at much higher median rates than other predators (up to 14 times higher). ” Thus they are comparing the rates of all other predatory species taken one at a time to that of humans. There may be natural predators who have a very high predation rate (higher than humans), but they are masked by the average of other predators with low rates. The clear implication is that we take more adults than do predators. Much of the media coverage interprets their results this way. This is absolutely not true as shown in the analysis below which shows that humans take about ½ as many adult fish as marine predators. To compare the rates of fishing mortality to rates of natural mortality (almost all of which is from predation), I used the RAM Legacy Stock Assessment Data Base (www.ramlegacy.org) the same data base used by Dairmont et al. to obtain fishing mortality rates. I selected the 223 fish stocks for which we had both natural mortality and human exploitation rates, and plot the distribution of the two in the graph below. We find that fishing mortality on adult fish is on average roughly ½ of the predation rate — not 14 times higher as the abstract of their paper would leave you to believe. Remember Dairmont were not looking at all of predation, but counting each predator as an individual data point. 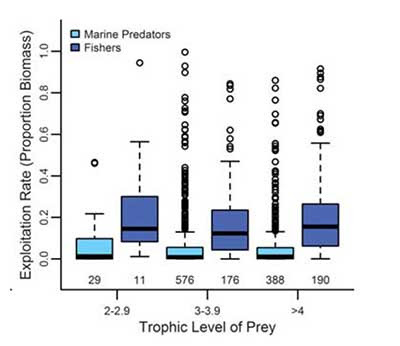 In aggregate predators take far more adult fish than do humans, but you would not understand that by reading the Dairmont paper. The authors conclude that argument that globally humans are unsustainable predators. This flies in the face of the fact that we have considerable empirical evidence that we can sustainably harvest fish and wildlife populations. The basic key to sustainable harvesting is keeping the fraction exploited at a level that can be sustained in the long term, and adjusting harvest up and down as populations fluctuate. The Food and Agriculture Organization of the United Nations provides the most comprehensive analysis of the status of global fisheries and estimates than about 30% of global fish stocks are overexploited – the other 70% are at levels of abundance that are generally considered sustainable. Many fisheries are evaluated by independent organizations like the Marine Stewardship Council and Monterey Bay Aquarium and classified as “sustainable” yet Dairmont and co-authors suggest that no fisheries are sustainably managed. As an example, sockeye salmon in Bristol Bay Alaska have been sustainably managed for over a century, have been evaluated as sustainable by every independent organization, and the key is limiting harvest so that enough fish reach the spawning grounds to replenish the species. In this case humans take about 2/3 of the returning adult salmon – a much higher fraction than the predators, but it is sustainable and stocks are at record abundance. Darimont and coauthors suggest we need to reduce exploitation pressure by as much as 10 fold. This may be true in some places but in the US we manage fisheries quite successfully. We agree with the authors that management is key to keeping healthy and sustainable populations of fish and wildlife. However, instead of “emulating natural predators” and decreasing human exploitation across the board, we need to work to use our knowledge to expand good management practices to more species and areas of the world. Dairmont and co authors argue that humans should act more like natural predators, without giving any justification for this. Boris Worm provided a comment also published in the same issue of Science in which he said “we have the unusual ability to analyze and consciously adjust our behavior to minimize deleterious consequences. ” I couldn’t agree more. We manage our fisheries to balance benefits to humans and maintain healthy ecosystems. We know how to sustainably manage fisheries and wildlife and in many places are doing a very good job at it.